A soccer story—for boy and girls alike—just in time for the World Cup! “Friends versus friends” teams are formed, the field is cleared of cows, and the game begins! But will a tropical rainstorm threaten their plans? 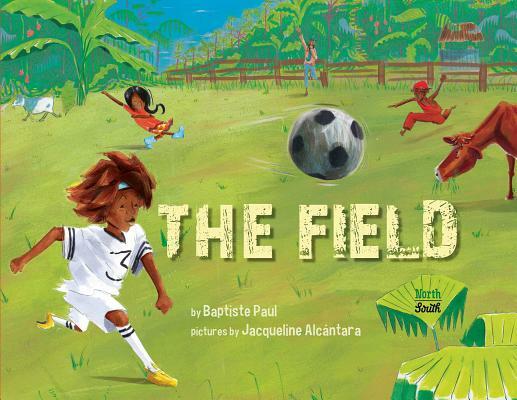 The world’s most popular and inclusive sport has found its spirited, poetic, and authentic voice in Baptiste Paul’s debut picture book—highlighting the joys of the game along with its universal themes: teamwork, leadership, diversity, and acceptance. Creole words (as spoken in St. Lucia, the author’s birthplace island in the Caribbean) add spice to the story and are a strong reminder of the sport’s world fame. Bright and brilliant illustrations by debut children’s book illustrator Jacqueline Alcántara—winner of the We Need Diverse Books Illustration Mentorship Award—capture the grit and glory of the game and the beauty of the island setting where this particular field was inspired. Baptiste Paul is a man of many talents—from woodworking to gardening to entertaining hordes of children for hours on end. Born and raised in the West Indies (St. Lucia), Baptiste is a native Creole/Patois speaker and enjoys roasting his own coffee and chocolate as well as eating anything he can cook on a grill. Baptiste holds degrees in environmental studies and political science from Bucknell University and currently resides with his family near a wildlife sanctuary in Green Bay, Wisconsin. This is his first picture book for NorthSouth Books. *STARRED REVIEW. Gather around for a boisterous game of futbol in Paul and Alcántara's excellent picture-book debut...Irresistible fun. The only thing you have to bring to this story is a love of good books, and a capacity to be wowed when a debut team pulls out a book as cool as this. A story so good you’ll be half tempted to pull your own soccer ball out of the shed and take it to the nearest muddy park for a spin. A true original. *STARRED REVIEW. The excitement of the game overflows from the pages and the children, from the beautiful greenery that surrounds them and the brightness of their clothing, to the dynamic movement in Alcántara’s artwork...Staccato phrases match high energy of the impromptu game. *STARRED REVIEW. Vibrant illustrations, full of movement and saturated with color, match the vigor and excitement of the text. This is a wonderful debut picture book for both the author and the illustrator. It is sure to be one that will be begged for over and over again, whether soccer fan or not. The children’s elongated, exaggerated movements create an almost constant sense of motion in Alcántara’s vividly colored paintings, and their enthusiasm for futbol is infectious.